Take this incredible two-hour journey through some of Sedona's most beautiful land, the Broken Arrow Trail. Your knowledgeable tour guide will lead you through a trail surrounded by juniper and cypress trees. Also seen on your tour will be the famous Sedona Red Rocks including the Bell Rock, Chapel Butte, and the Rock of Gibraltar. Submarine Rock and Chicken Point are two guest favorites followed by Mushroom Rock and the Point of No Return. 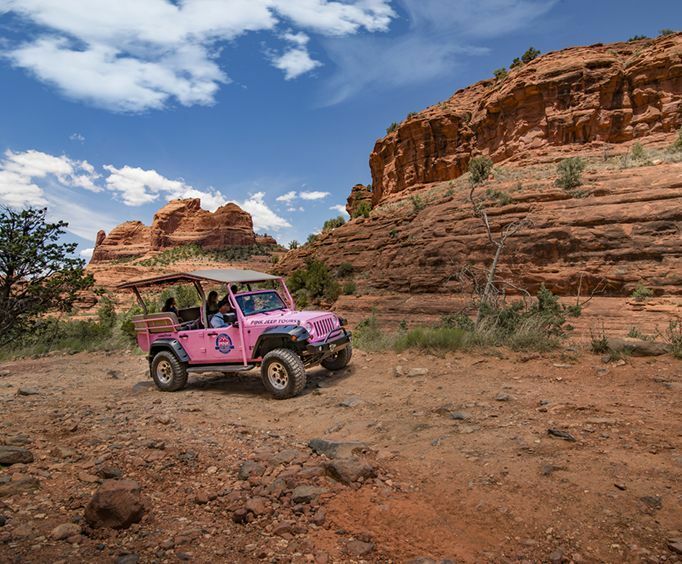 Pink Jeep Tours are known for their pastel-colored, four-wheel drive, open-air Jeep Wranglers that take tourists through some of the most beautiful parts of the country. Be warned, the Broken Arrow Trail tour will be a bumpy ride! Not only are the tour guides specialists in the knowledge of the area, they are also trained and certified 4x4 driving experts. Providing you with excellent scenery, interesting information, and good humor, these tour guides are sure to make your experience an even greater one. Your first stop along the tour is Submarine Rock. Once you arrive, you'll be able to get out and peruse the area, climbing some massive rocks. As you walk through the unique rock formations of Submarine Rock, your tour guide will be informing you of the interesting story that lies behind the landmark. Next, you'll head to Chicken Point. Are you thinking that's a funny name? Well, once you arrive, you'll learn just how it was coined with such a silly name. As you continue your tour, you won't need to get out to see Mushroom Rock, The 747, Chapel Butte, and Rock of Gibraltar. Prepare for the Point of No Return to finish up your tour. Make sure to get your cameras out for this one. You definitely won't want to miss the sights. Don't miss out on this wonderful way to see what Sedona, Arizona is known for − its Red Rocks. 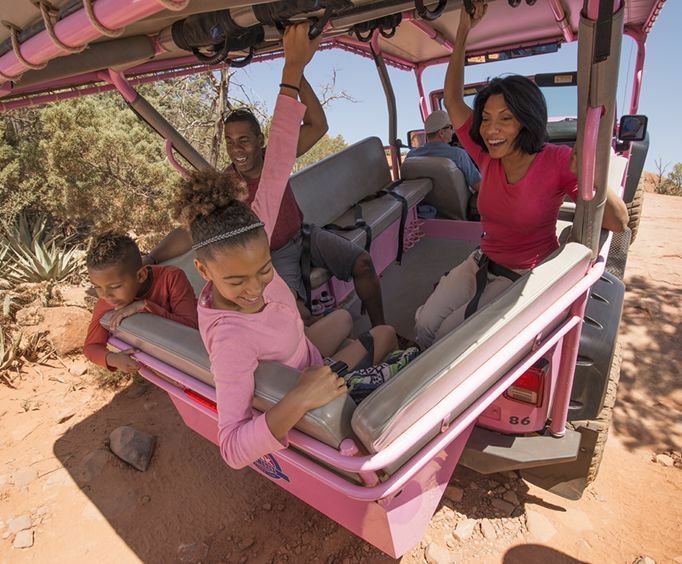 Bring the whole family for an incredible sightseeing experience!